Darat al Funun-The Khalid Shoman Foundation welcomes your application to join its 2019 Summer Academy. Launched on the occasion of our 30th anniversary, with a regional scope, the 2019 Summer Academy is an intensive four week program at Darat al Funun starting 15 June 2019 combining art practices and theory for artists of all experience levels to enhance their skills, through a series of intensive courses provided by artists, curators, and academics. Grounded in the Arab world, artists will have the opportunity to exchange knowledge with their peers, and to hear and learn from prominent guest speakers. This first year, the practice-based focus of the 2019 Summer Academy will mainly be on developing and structuring a photographic project from conception to creation to presentation. We are looking for a maximum of 12 motivated and committed participants from a mix of backgrounds, but particularly graduates and emerging artists who are working or considering working in photography, and who want to explore, reconnect or reimagine their practice grounded in the Arab world. At the same time, participants will be able to hone their theoretical skills through courses on art criticism and art writing – with a special focus on Arab writers and the Arabic language, as well as perspectives on curatorial and art practices in the region. Courses are given in Arabic and English and command of both languages is required. The first two weeks of the Summer Academy will be directed by Palestinian artist Ahlam Shibli. Participants will deal with the notion of ‘home’ and will develop a photographic project focusing on this topic. All steps, from a general discussion of what is home (how can we find it, define it, lose it, describe it), through fine-tuning of specific individual projects, to the presentation in the final exhibition, will be part of the course. The participants will choose specific subjects and discuss them in group meetings. Before going into town to photograph, they will write scripts reflecting subject, methods and goals. After the photographs have been taken, the process will continue with reviewing and editing the photographs, writing captions, artist’s statements and finally presenting the works. During the third week of the Summer Academy, independent curator and art historian Salwa Mikdadi, Associate Professor of the Practice of Art History at NYU Abu Dhabi, will give an introduction on Arts and Politics in the Arab World. Participants will also be given readings and take part in group discussions. In addition, a seminar titled “The Black Radical Imagination: Implications for Art Criticism” will focus on the linkages between Postcolonial studies and the Black radical traditions and their implications for the visual arts in general and art criticism more specifically. These ideas will be explored through the writings of Black revolutionary intellectuals such as Franz Fanon. The seminar will be led by Salah Hassan, Director of the Sharjah Africa Institute, UAE, he is the Goldwin Smith Professor and Director of the Institute of Comparative Modernities, and professor of art history and visual culture in the Africana Studies and Research Center, and the Department of History of Art and Visual Studies, Cornell University. The last week of the Summer Academy will be directed by Syrian photographer Hrair Sarkissian. The course will focus on how to use photography to rethink personal, historical, or socio-political narratives. Participants will explore these themes grounded in their own experiences, develop a narrative under the creative guidance of a writer, think through how to represent this photographically, and finally develop their project. All participants are expected to attend and actively participate in the full four-week program. We ask participants to bring a camera (preferably digital, in order to be able to see results during the course), laptop or tablet, material from their own archives. No tuition fees are required at our Summer Academy. We do, however, expect you to pay your own travel costs to/from Amman. For participants from outside Amman, we will offer shared accommodation in one of our residency flats and a per diem. To apply, please email your CV and a short statement of interest (150-250 words) in English or in Arabic to: opencall@daratalfunun.org on or before 15 April 2019. Any inquiries can also be sent to this email address. Successful applicants will be contacted to discuss their participation from 1 May 2019. Darat al Funun is a home for the arts and artists from the Arab world. We trace our beginnings to 1988, and are now housed in six renovated historical buildings from the 1920s and 30s, with a restored archaeological site in the garden. We aim to provide a platform for contemporary Arab artists, to support art practices and artistic exchange, to stimulate critical discourse, and to research, document, and archive Arab art. 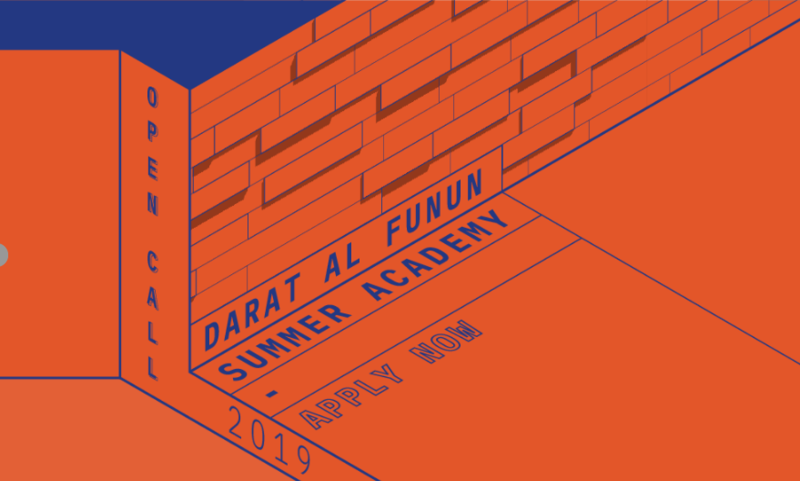 The 2019 Summer Academy takes its inspiration from the 1999-2003 Darat al Funun Summer Academy which was established on the occasion of our 10th anniversary to provide a key opportunity for emerging artists to study and work under the supervision of the late Berlin-based Syrian artist Marwan. Over the course of four years, over 60 artists from Jordan, Palestine, Syria, Lebanon, Egypt, and Iraq attended the academy.